The advantage of the kit is that it has a vinyl liner that protects the grass from damage and the kit is able to accommodate uneven and sloping backyards. Some kits also provide coloured lines to represent an actual hockey rink. 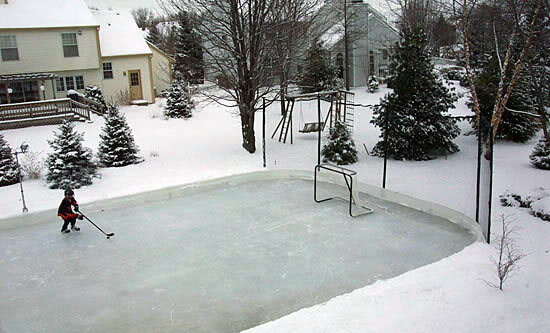 The backyard ice rink kits are so popular because there are no lakes, ponds, or rivers to skate on anymore. My dad used to tell me stories of playing hockey on the river by his house when he was a child. Today in Southern Ontario all the land is owned by housing developers. Where there was once an open field that would flood and freeze in the winter is now a row of townhouses. The river that everyone once had access to is now part of someone’s backyard and is private property. Of the few community lakes or ponds that do still exist they don’t freeze over until the end of January due to global warming and even then parents don’t let their kids skate on it in fear that the ice will give way. Ice rink kits are a way of keeping our Canadian heritage and traditions alive. They are safe, easy to make, and give the kids hours of fun and exercise outdoors.